Jayco is based in Middlebury, Indiana. The company was founded in 1968 by Lloyd Jay Bontrager. The company name is derived from his middle name at the suggestion of his wife, Bertha. In 2011 Bontrager was inducted into the "RV Industry's Hall Of Fame for being one of the most influential men in the 100 year history of RVing". He played a role in the development and innovation of several types of unique lifter systems for their travel trailers. Bontrager developed a trailer fold-down system in 1967 and started the business of making travel trailers in two chicken houses and a barn. In the first year of operations the company sold 132 trailers, and by the end of 1968 it had 15 employees. Because of the increased demand for their travel trailers, in 1969 they moved out of Bontrager's farm buildings to a new factory site nearby that provided more manufacturing space. The company continued to grow and in 1970 built another plant in Harper, Kansas. On Easter Sunday,1985, Lloyd Bontrager was killed when his small airplane crashed in the vicinity of Municie, IN. Bertha became Chairman of the Board at Jayco, and later her sons Wilbur and Derald assumed leadership roles within the company. Despite being sold to Thor Industries in 2016, Jayco was still managed by members of the original Bontrager family. Wilbur retired at the beginning of 2019. Currently, Derald Bontrager is President and CEO. In 1970 the company built approximately 2,000 fold-down travel trailers and sold them throughout the United States and Canada. 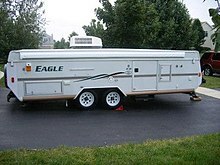 In 1971 they produced about 3,500 camper trailers. In 1976 Jayco produced the first "fifth-wheel" trailer with a full-height stand-up front bedroom. The Jayco company logo is a blue jay in flight. The company mascot is also a blue jay named "J. Jay". The company's workforce of approximately 3200 employees is about 70 percent Amish and Mennonite. Jayco manufactures about 50,000 RVs per year going into the twenty-first century. After 48 years in business, Jayco reached the 1 millionth manufactured RV milestone in April 2016. In 2018, Jayco celebrated its 50th year in business. To commemorate with employees and dealers, Derald Bontrager offered a special toast at the 2018 Annual Jayco Dealer Homecoming. On the 50th day of the year, February 19th, Jayco performed 50 acts of kindness in and around Middlebury as a way to thank the community for its support over the years. The day included gestures like making donations to local charities and filling up neighbors’ tanks at the gas station. In addition to the Jayco brand, Jayco acquired Entegra Coach in 2008, Starcraft RV in 1991 and Highland Ridge in 2014. Since building the original pop up camper in 1967, Jayco has expanded its lineup to include travel trailers, fifth wheels, toy haulers, class C and A motorhomes. Jayco is best known for their Jay Flight model, which became available in 2001. Since 2005, the Jayco Jay Flight has been the #1 selling travel trailer brand. In 2006, the Jay Flight brand expanded its model lineup with the addition of the seasonal model, Bungalow. Then in 2007, due to its commitment to quality, Jay Flight won a DSI Quality Circle Award in the first year the product line was eligible. As part of an exclusive deal with the legendary American company, Jay Flights began featuring tires from Goodyear® with Durawall® technology standard. Jay Flight was recently listed as a Gold Medal Green Certified RV, the first of its kind. Following Lloyd Bontrager's death, Al Yoder Jr. served as president of the company and immediately started a drive to improve quality of the products they produced. Jayco RVs are made from a variety of materials and techniques. Wafer board, engineered wood are not used, instead using plywood, wood wall, ceiling and floor stringers insulated with fiberglass...or laminated construction with foam core insulation and aluminum frames. Jayco assembly line employees include Amish and Mennonites from the community. Several Jayco products feature the Magnum Truss Roof System , which can withhold 4,500 lb, thanks to a 7-inch header beam, thicker wood (not aluminum), oversized nail plates and screws (not staples). Altogether, this creates for a more secured structure. Jayco also promotes safer RV towing with its JaySMART™  exterior lighting system, which more clearly indicates braking and turn signals to others on the road. The components in the JRide® system give the motorhome more stability when cornering and redistribute vehicle weight, absorb road shock, dampen noise, minimize vibrations, reduce sideways tilting on turns to keep the motorhome balanced, and offer more robust braking power. The Embark luxury coach is built on the all-new Spartan K1 chassis with a 360-horsepower Cummins diesel engine and features independent front suspension with Bilstein shocks. This was the first new contract with a motorhome OEM for Spartan Motors since 2015. Through smart sustainability efforts, Jayco Inc. is creating better ways to build better RVs using fewer or renewable natural resources. Their EcoAdvantage program is cited for its use of sustainable materials, waste reduction and recycling programs, reduction of harmful volatile compounds found in RV components, installation of efficient appliances and fixtures, use of energy-efficient design and construction, and utilization of renewable, clean energy. In 2010, all of Jayco's products were green certified by TRA Certification, an accredited certification. This made Jayco the first major RV manufacturer to be 100 percent green certified and fully recognized for building products with green manufacturing processes and materials. In 2013, it was reported that, through combined efforts between employees, suppliers and community partners, Jayco Inc.'s three operating divisions, Jayco, Starcraft and Entegra Coach, recycled 1,284 tons of wood, 13,221 tons of scrap metal and 1,801 tons of cardboard and paper. Accordingly, that's enough gas for Americans to drive more than 845,600 miles and enough electricity to power 1,129 homes for a year. Through these aggressive efforts, Jayco also saved 59,900 mature trees. Jayco has had a recycling program in effect since the early 1980s, and has received several recognitions for its recycling efforts including a Governor's Award of Excellence. Jayco campers are sold in Canada. Jayco, Inc., partnered with a UK-based company in the late 1970s and produced a tent camper for the European market. In 1975 Jayco Australia Ltd was founded by Gerry Ryan, OAM, (who remains the managing director). In 1976 Jayco Australia developed its first camper trailers and production commenced in January 1976. Jayco of Australia quickly established a reputation for producing high-quality, competitively priced caravan and camping products, and within a few years it had become the #1 player in the Australian camper/caravan industry. Now in its fourth decade, the company – with some 1100 employees – is a manufacturing success story of Australia. The company was hard hit in the energy crunch of the 1970s, and several of their plants were closed temporarily, including their Kansas and Canadian plants. In the late 1980s and early 1990s they also suffered another slowdown due to the high price of gasoline, though not as serious as that of the 1970s. In spite of this slowdown the company increased its plants and production output. They went from the fourth largest manufacturer of towable products to the second largest by 1995 with a workforce of 1,300, which has increased since then to about 1,500 employees. Jayco has at various times built products that turned out to be unsuccessful, including a fold-down style camper that opened onto a pontoon boat, a four-wheel camper trailer that resembled a motorhome without a cab, and a fold-down trailer camper version, with a living area that flipped out directly onto the ground. Jayco developed a special travel club called "Jayco Travel Club" that has yearly vacation plans. It has over 100 chapters in the United States and Canada for their customers. The chapters are called "Flights" and often contain references to the blue jay, which is Jayco's logo and mascot. Year-round, Jayco conducts free factory tours. The tour starts at the "Griner House," an old restored farmhouse originally built in 1880 that serves as the visitor center, with a 15-minute video on the company's history and production methods. The factory tour takes about one and a half hours. ^ "UPDATE: Jayco expansion to create 360 jobs in Twin Falls". Magic Valley. ^ a b c d e f g h i j "Jayco, Inc. company history". Fundinguniverse. International Directory of Company Histories, Vol. 13. St. James Press, 1996. 2016. Retrieved August 17, 2016. ^ a b c d e "Jayco Factory Tour in Middlebury, IN". Watch it Made in the USA. Karen Axelrod and Bruce Brumberg. 2016. Retrieved August 17, 2016. ^ Stephanie + Jeremy. "RVFTA #210 Jayco's 50th Anniversary Celebration with Bertha Bontrager Rhodes". RVTA. ^ Brown, Alex (May 17, 2016). "Jayco Hits Milestone". Inside Indiana Business. Frankly Media and Grow Indiana Media Ventures. Retrieved August 17, 2016. ^ Booker, Ted. "Jayco hits milestone with 1 millionth RV". south bend tribune. ^ Kessler, Rick. "Jayco Inc. Marks 50th Anniversary at Homecoming". RV Business. ^ Ernstes, ED. "Jayco celebrates 50 years with 50 acts of kindness". ^ "Thor Announces Acquisition of Jayco for $576 Million". pr newswire. ^ "RV Executive Today: Top-Selling Brands For 2017". RVBusiness. ^ "Quality Circle Award". RVDA. ^ "Magnum Truss Roof". Blade Chevrolet. ^ "JaySMART Lighting System Improves RV Safety". RVBusiness. ^ "JRide for Jayco Motorhomes". Jayco. ^ GALLOWAY, MITCH. "Spartan Motors partners with Indiana RV OEM". MiBiz. ^ "VIDEO 1: Jayco Sourcing Sustainable Products". RVBusiness. ^ MacNeal, David. "Jayco Reports Its RVs are 100% Green Certified". RV Pro. ^ "Jayco's EcoAdvantage Program Meeting Goals". RV Business. ^ "Jayco Founders Honored with RVDA Titan Award". RVDA. ^ "RV Executive Today: Top-Selling Brands For 2017". RV Business. ^ "Good as Gold … and Silver and Bronze". Trailer Life. ^ Bunker, Kristopher. "And the Winners Are …". Motorhome. ^ "Happy Trails". Happy Trails RV. 2016. Retrieved August 17, 2016. ^ Tribune, South Bend. "Thor acquires Jayco in $576 million deal". Retrieved July 1, 2016. Plunkett (2010). Plunkett's Automobile Industry Almanac. Plunkett Research. ISBN 978-1-59392-152-1. Wikimedia Commons has media related to Jayco Company.